The secret to an easy Easter meal? Your slow cooker! Free up your oven with these easy slow-cooker Easter recipes — from glazed ham to coconut cake. Easter isn’t as chaotic of a cooking holiday as, say, Thanksgiving. But ovens are only so big, so if you max yours out don’t forget that you can throw that ham, a side dish — or even dessert — into a slow cooker. It’ll save precious room, and can also double as a serving vessel that’ll keep the dish warm. Most hams bought today are fully cooked, which means they can end up overcooked if left in the oven for too long. Avoid dried-out ham this year by slowly heating it in a slow cooker. 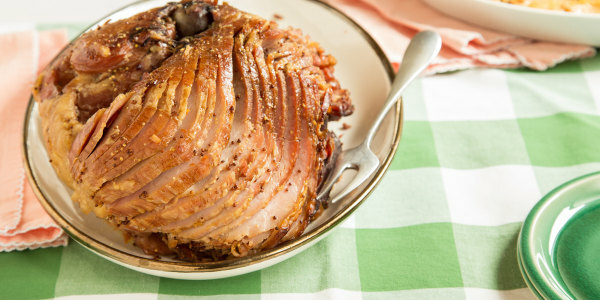 Serving a ham for your Easter buffet doesn't have to be hard work. Use your slow cooker to do the heavy lifting! This so-simple method ensures a centerpiece dish that's tender and full of flavor — never dry or overcooked. Topped with a sweetly spiced mustard glaze, every slice is dressed to impress. 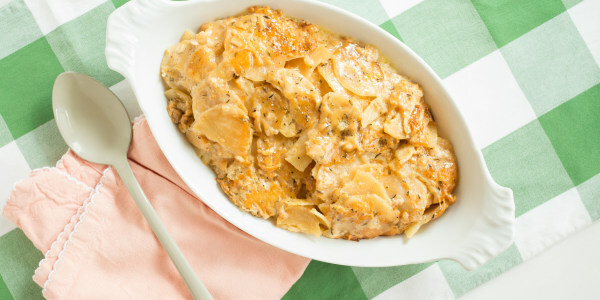 Creamy, cheesy scalloped potatoes are an Easter side dish that no one can resist, and now this traditional party-pleaser is even easier when you make it in the slow cooker. Who knows? This simple hands-off method might even convince you to make this indulgent, elegant comfort food part of your weeknight dinner rotation. Roasted asparagus are great and all, but if you’re looking for something else to do with the springtime veggie, throw together this slow-cooker cheese and asparagus risotto from Claire of the blog A Little Claireification (featured in a guest post on The Shabby Creek Cottage). It takes only about five minutes to prep, she says, but the creamy dish tastes like you stood in the kitchen, stirring away for hours. Take your scalloped potatoes a step further by using smoked Gouda. Pittsburgh-based food blogger Cory Van Horn of Culinary Cory says that the smoky cheese is the secret to this delicious recipe. The cheese adds a bit of smokiness alongside the cheddar and Parmesan, making the dish stand out from all the potatoes au gratin you’ve had at your relatives’ houses. And though the golden crust tastes delicious, just be sure to coat the slow cooker with nonstick oil before cooking, he cautions. On holidays, recipe developer Nikki Gladd, of Seeded at the Table, noticed that her readers go crazy for her corn casserole and Crock-Pot corn pudding. So she decided to mix things up with this slow-cooker creamed corn, inspired by her family’s trip to Rudy’s Country Store & Barbecue in Austin, Texas. If you’re worried dessert will get lost in the shuffle as you get swept up in preparing Easter dinner, take a look at this slow-cooker coconut cake from Florida-based blogger Tiffany Bendayan, of Living Sweet Moments. It tastes like a cross between cake and flan, and is made similarly to a tres leches cake, says Bendayan, who was raised in Venezuela. Simply bake the cake in a slow cooker, then pour the coconut cream on at the end. Top it with sweetened coconut flakes and serve warm or cool. This article was originally published on April 3, 2015.